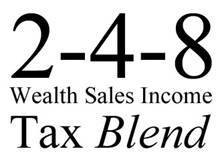 The 2-4-8 tax blend is a proposed comprehensive tax reform plan for the U.S. that combines net wealth, sales (VAT), and income tax bases in ways that would not have been feasible just a decade ago. The use of three tax bases is consistent with the definition of income, "as the sum of consumption and any change in net worth. This definition highlights three likely bases for a tax: income, consumption, and net worth. Tax rates can be applied to essentially any base (or combination of bases) to raise the revenue that government requires.â€ The combined tax bases are broad and enable the mathematically lowest rates possible for any given revenue target. All tax expenditures (or "tax loopholes") would also be eliminated except as otherwise noted (e.g. tax exempt retirement funds). Individual tax reform replaces Payroll taxes with a 2% tax on net wealth (excluding $15,000 cash and tax exempt retirement funds) and reduces the income tax rate to 8%. Because the net wealth base taxes the imputed income from capital it also replaces capital gains, estate and gift taxes. Corporate tax reform imposes a 4% value added tax (VAT) on all businesses and reduces the corporate income tax rate to 8%. The tax blend was first suggested to the President's Advisory Panel for Federal Tax Reform on August 28, 2005 with the title, "2-4-8 you may appreciate". The "2-4-8" in the title represents approximate tax rates used for the initial scoring of the tax plan. ...the income tax imposes efficiency costs on the economy. These costs arise when high tax rates discourage work, savings, and investment; distort economic decisions of individuals and businesses; and divert resources from productive uses in our economy. Our tax code contains all kinds of incentives for taxpayers to favor activities or goods that are taxed less than others. Provisions for the taxation of wages, of gains on the sale of securities and homes, or of other economic activities influence how much people work and save. As one small business owner explained to the Panel, the tax code affects almost every business decision he makes: where to invest, when to invest, how much to invest, what kinds of machines and equipment to use in production, how to finance investment, etc. When taxpayers change their behavior to minimize their tax liability, they often make inefficient choices that they would not make in the absence of tax considerations. These tax-motivated behaviors divert resources from their most productive use and reduce the productive capacity of our economy. Economic growth suffers as taxpayers respond to the tax laws rather than to underlying economic fundamentals. These distortions waste economic resources, reduce productivity, and, ultimately lower living standards for all. The elimination of tax expenditures under the 2-4-8 Tax Blend means that an investor will focus only on the bottom line without the distortion caused by the current tax code. A taxpayer who reinvests in his or her own business (not taking salary or dividends) will also avoid income taxes (as they do now). The growth in the value of the business that comes from reinvesting the profits is captured in subsequent years as part of net wealth taxation. The tax blend effectively creates a powerful carrot (low income tax rate) and stick (net wealth tax) approach to reinforce maximum productive investment. The "carrot and stick" incentives to invest noted above may be sufficient to encourage some job creation, but replacing the business payroll tax on labor is a more direct incentive by specifically eliminating the 7 1/2% tax on labor. University of Chicago Economics Professor, Casey Mulligan, estimated in September 2011 that each, â€œpercentage-point reduction in employersâ€™ [payroll] costs raises employment by about a percentage point and real gross domestic product by about 0.7 percentage pointsâ€. A literal 7 1/2% reduction in the unemployment rate according to Mulligan's calculation may be unlikely, but even a reduction to a 4% unemployment rate is generally considered as full employment. Elimination of the employee share of the payroll tax also results in a 7 1/2% increase in take home pay for workers. The employee share is over $400 billion and will boost the economy through increased consumer spending. A comprehensive income tax base, which is perhaps the broadest tax base, would include all forms of income. Most people think of income strictly in terms of wages. But a comprehensive measure of income also includes anything that allows you to spend more, either now or in the future. Capital gains and losses, dividends, rental income, and royalties all represent income that does not come in the form wages. To illustrate, consider that Warren Buffett reportedly increased his wealth by $3 billion in 2011 and if â€œhe had to realize those gains, even at 17.4%, he would have had to pay $522,000,000â€. If he had to pay the proposed 30% â€œBuffet Ruleâ€ rate the tab would be $900,000,000. The net wealth tax approach does not tax the capital gain but would assess 2% against the average principle of $41.5 billion (beginning with $40 billion and ending with $43 billion for the year). This computes to $830,000,000 â€“ (an amount less than the â€œBuffet Ruleâ€ computation if deferral was eliminated and the capital appreciation was taxed as income). In fact Mr. Buffet only paid $7 million in taxes on income of $40 million. The $522 million in tax on the appreciation of $3 billion is deferred just as similar tax deferrals have accrued year after year. Mr. Buffet may owe more than $10 billion to the U.S. but he doesn't owe it yet, and the deferral process gives him the opportunity to give most of it away to charity to avoid taxes. Tax fairness of capital gains looks at what, how and when the capital appreciation is measured. A capital gain tax measures the gain of specified capital assets only when (and if) the asset is sold. It computes the difference between the amount paid for the asset (known as tax basis) and the market price realized when the asset is sold. No adjustment is made for inflation or deflation in computing the appreciation. The gain might be taxed at the same rate as ordinary income (e.g. up to 35%) or at a reduced rate (e.g. up to 17.4%). According to University of Pennsylvania Law School Professors David Shakow and Reed Shuldiner, â€œA wealth tax also taxes capital that is not productively employed. Thus, a wealth tax can be viewed as a tax on potential income from capital.â€ Supra. Under the 2-4-8 Tax Blend the net wealth tax provides both fairness and a better measure of value. It taxes the imputed income from all capital assets regardless of type. A 2% net wealth tax rate is the equivalent of a 33% income tax rate on a 6% return of investment (or a 25% income tax rate on an 8% return of investment, etc.). It is also important to keep in mind that while a one to twelve rate of return on investment may be a typical long term average, higher rates of return can be expected with a flat 8% income tax rate. By taxing the imputed income from net wealth on an annual basis, the unfair deferral and avoidance of tax payments by the investment class ends. As noted in the section on Business Investment above, the elimination of capital gains taxes also encourages productive trade which might otherwise be prevented by tax considerations. According to a July 2012 report from the Congressional Research Service, in 1995 the top 10% of the country had 67.8% of the countryâ€™s wealth while the bottom 50% shared only 3.6% ($1,912 billion [in 2010 dollars]). The bottom share eroded to 2.5% before the Great Recession of 2007 and by 2010 it had tumbled to 1.1% ($584 billion) â€“ (a 70% loss of $1,333 billion over 15 years). The loss of wealth to the bottom half the country was offset by a 6.7% gain ($3,558 billion) for the top 10%. America has prospered over the last 15 to 20 years but the prosperity has not been shared by most of the country as can be seen in the table below. Economists do not know for sure if there is a causal relation between income inequality and economic recession but there is a correlation. Paul Krugman wrote that before the crisis of 2008 he often spoke about the concentration of income at the top and responded to questions about whether the country might be on the verge of a depression by saying it was not necessarily so. After the crisis this winner of the Nobel Prize in Economics revised his opinion to, "Well, whaddya know?". If there is an, "arrow of causation running directly from income inequality to financial crisis ... maybe, but itâ€™s a harder case to make". Id. Krugman also speculated about potential common causes of income concentration and the economic crisis such as low tax rates and deregulation. Half of America has $3 today for every $10 they had in 1995. An extended period of income inequality will lead to wealth inequality and the accompanying loss of consumer spending and economic resilience. To put tax transfers and wealth in perspective, consider that the $1.3 trillion in tax expenditures which the tax code redistributes each year is twice the $584 billion owned by half of America. The 2-4-8 Tax Blend avoids most of the income and wealth redistribution effects of the current tax code by levying the same rates on all taxpayers and eliminating the tax expenditures. The issue of corporate deferral of foreign profits is resolved by lowering the corporate income tax to 8%.